State Bank India Job Circular has been found on my website. State Bank of India (SBI) is one of the best foreign and commercial Bank in Bangladesh recently State Bank of India (SBI) published Job Circular in State Bank of India (SBI). State Bank of India (SBI) has been published job circular Visa Executive and Visa Assistant. State Bank of India (SBI) with a 200-year history is the largest commercial bank in India in terms of assets, deposits, profits, branches, customers, and employees. 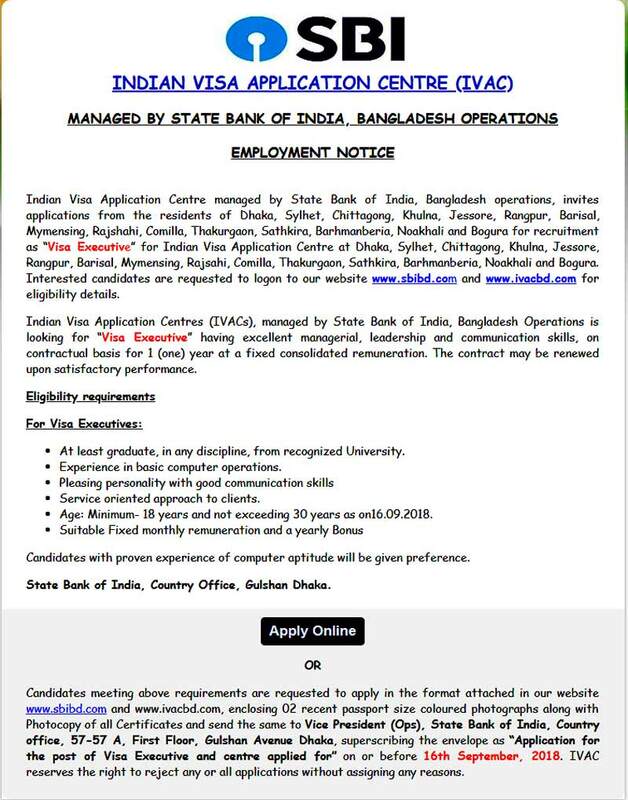 State Bank India Job Circular Visa Executive and Visa Assistant is application deadline 16th September 2018. ■ Job Description: This job position is talented of the financial proposal to the bank authority for further review and selection purpose. State Bank of India (SBI) is an equal opportunity employer and welcomes applications from female candidates. State Bank of India (SBI) is an equal opportunity employer and welcomes applications from female candidates. Any persuasion will disqualify the candidature. Only short listed candidates shall be invited for the interview. State Bank of India Career It’s not only our customers who can be sure of a warm welcome. You can, too. Do you consider yourself as a natural born leader? Are you looking for a challenging career with superb prospects for ownership and success? So if you are ready to take a voyage in a vibrant and challenging corporate environment and eager to fast track your career in a professional and institutionally managed environment, please to apply to State Bank of India Career.